Cruising under sail is the perfect way to appreciate the slow pace and natural beauty of the Caribbean islands. This full-board sailing cruise visits unspoilt islands with white-sand beaches and included watersports, snorkelling and optional scuba diving. Interesting excursions complement this stress-free itinerary. Leaving St Maarten in the Dutch West Indies, this 7-night cruise aboard Star Flyer first visit the island of Anguilla, where a mixture of down-to-earth island culture and powdery sandy beach is a relaxing introduction to Caribbean life. Virgin Gorda is the first of four calls in the British Virgin Islands, where the 1000-ft Gorda Peak slopes down to the sea. Massive boulders are strewn along the sandy beach at the famous 'Baths'. Uninhabited Norman Island is skirted with sea-caves, thought to be the hiding-place for the booty which inspired Robert Louis Stevenson's 'Treasure Island'. There is time to relax on the 'barefoot' island of Jost Van Dyke, noted for its Soggy Dollar Bar, before sailing to the rainforested island of St Kitts. The sailing cruise last call is at St Barts in the French West Indies. The capital, Gustavia, is now visited by the large yachts of the rich and famous, with a mixture of local facilities and upmarket boutiques. Embark your ship in Philipsburg. The island of St Maarten is half-French and half-Dutch territory, and Philipsburg is the capital of the Dutch side. St Maarten has a lively nightlife and its small capital has good duty-free shops and some of the island's best restaurants. Anguilla is only 17 miles long, but it has fine sandy beaches, ideal for the ship's water-sports activities. A relaxing introduction to the Caribbean. Virgin Gorda was discovered by Christopher Columbus in 1493, and is noted for its famous Baths with swimming areas among large boulders on the sheltered beach. Admire the view of the bays and offshore islands from the hills, or take the ship's tender to the Bitter End marina complex with shops, restaurants and bars. Norman Island is thought to have been the inspiration for Robert Louis Stevenson's 'Treasure Island'. In 1750 the crew of a Spanish galleon mutinied, and numerous chests of silver coins were buried on the island. Norman Island is uninhabited,but it has a restaurant on the beach and excellent snorkelling. Later, moor at the yachting centre of Soper's Hole set in a stunning bay. Tiny Jost Van Dyke is known to travellers as the 'barefoot' island. With some of the best and least crowded beaches in the Caribbean and a relaxed atmosphere, it's the perfect place to unwind. Moor at Great Harbour or White Bay and try the famour 'Painkiller' rum cocktail at the Soggy Dollar Bar or another of the laid-back beach bars. 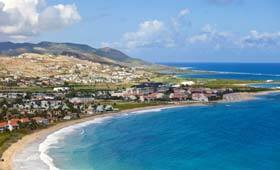 St Kitts is an island of rolling hills and lush rainforest vegetation. Stroll capital Basseterre's historic district, with its colonial and Creole influences, and spot the Circus, a small roundabout modelled on London's Piccadilly. Later, anchor off a local beach for shore activities. The rocky island of St Barts was a trade port where booty from sea raids was stored or sold. Now it is visited by luxury yachts owned by the world's wealthiest, and the pretty capital of Gustavia has upmarket boutiques and good French restaurants. Inland discover colourful flora and small settlements in the hills and valleys. 600 Euro OBC per couple or no single supplement on 21 Dec 2019 departure!